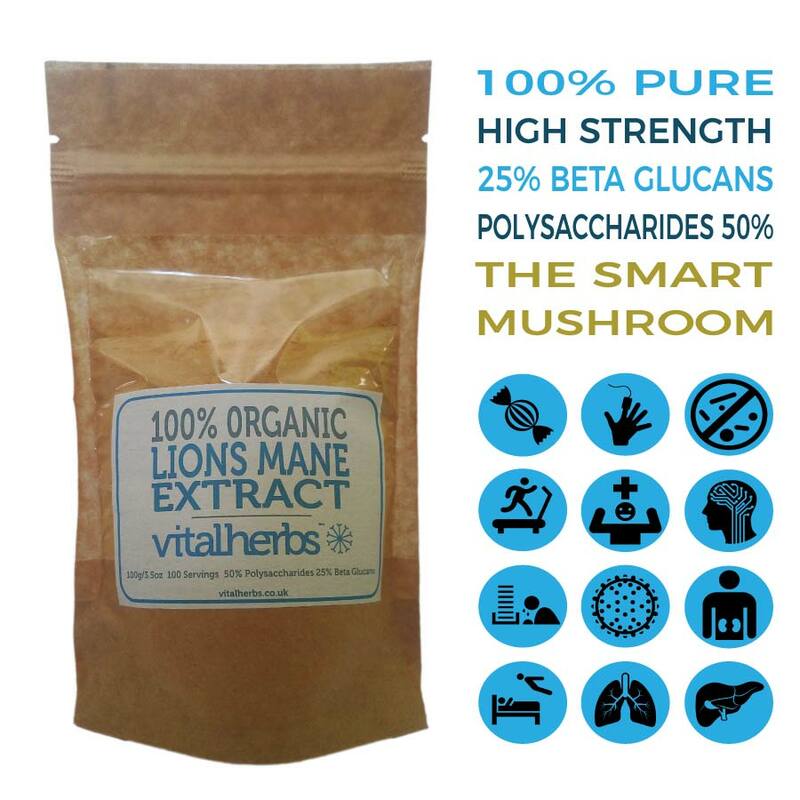 Our organic Lions Mane extract powder is made from the fruiting body of the Lions Mane mushroom and not the mycelium to maintain all it’s natural health generating benefits. 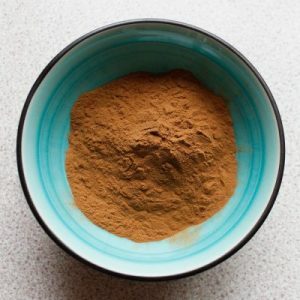 Dosage-Add half to one teaspoon of organic Lions Mane extract powder to hot water a smoothie or your favourite drink. Lions Mane may become popular as a powerful nootropic due to it’s possible effect on brain function. 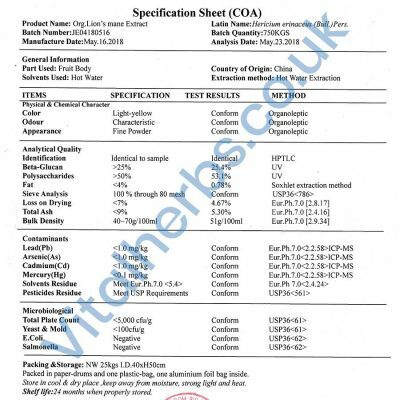 With over 50% polysaccharides and over 25% beta glucans this extract is the real deal! 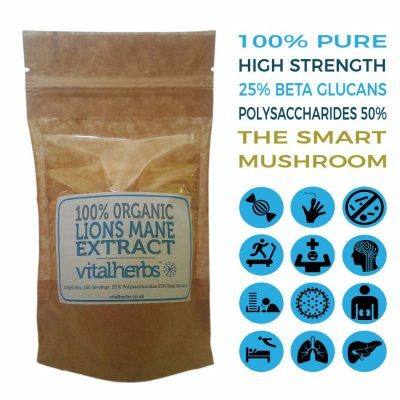 Our organic Lions Mane extract powder is made from the fruiting body of the Lions Mane mushroom and not the mycelium. 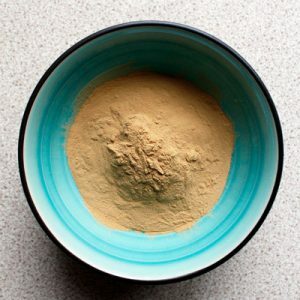 Because of our production method our Lions Mane extract powder contains more of the beneficial beta glucans, polysaccharides and the all important hericenones and erinacines found within the structure of the fruiting body. We believe in keeping things as close to how nature intended and so all our Lions Mane mushrooms, prior to being extracted, are cultivated on wooden logs just how nature intended. 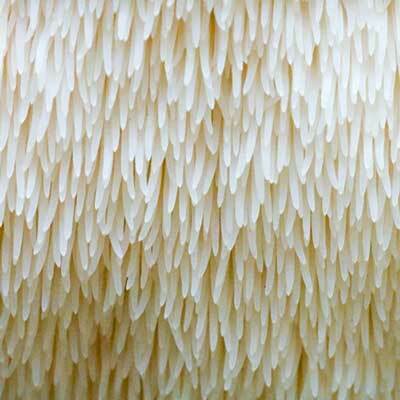 The Lions Mane fungus is put through a triple hot water extraction technique, this process makes sure that almost all the polysaccharides and beta-glucans and other health promoting elements are released from the fruiting body. 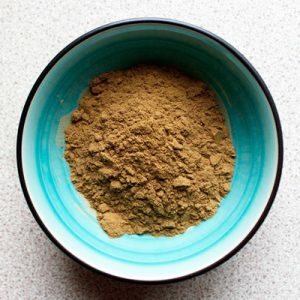 From our perspective not all herbal extracts are created equal and we pride ourselves on creating highly potent Lions Mane extract powder that not only says it’s amazing but can prove these claims! Used for centuries as a general tonic and health treatment, the Lion’s Mane Mushroom (also known as Hericium Erinaceus, Yamabushitake or Satyr’s Beard) is native to China, Japan, North America and Europe. Though it was traditionally prescribed as a general restorative, its effect on the brain has always been recognized. In Japan, it is called yamabushitake which means “mountain priest mushroom.” It’s named after the Yamabushi sect of hermit Buddhist monks believed to possess supernatural powers. According to legend, they used lion’s mane to stay focused during meditation. The reason Lion’s man is so special is that recent research has shown that it contains within it a not one but two nerve growth stimulate compounds (NGS) which have been named erinacines and hericiones. These rather clever hericones and erinacines stimulate neurons to regrow and rebuild myelin. 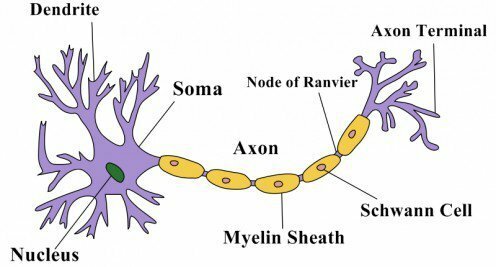 Myelin is the fatty substance that surrounds the axon of some nerve cells, forming a electrically insulating layer. This layer is essential for the nervous system to function properly. This rebuilding of nerve cells and thus improvement of nervous system function, could mean that Lion’s mane could play a vital role in the treatment of nerve related conditions as well as possibly repairing neurological trauma and increasing cognitive abilities. Lion’s Mane increases the amount of NGF in the brain, which enhances cognition by reducing inflammation, encouraging neural growth, and improving overall brain health. 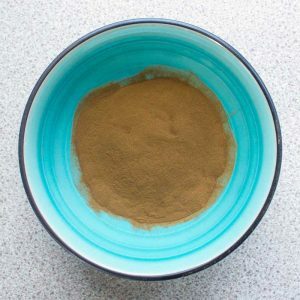 Take half to 1tsp twice a day before meals. 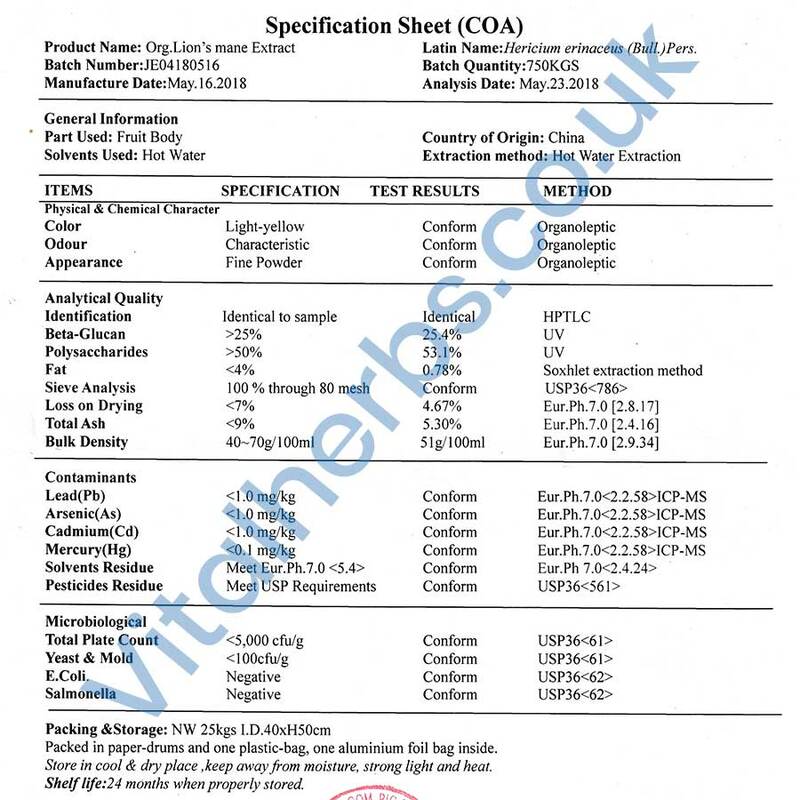 See product images for detailed analysis of our organic Lions Mane extract powder. Very happy with the quality of the product and the fast service thank you ! Glad you got your order quickly Ann 🙂 Yep it’s that time of year to get things rolling! Fabulous service. Super quick delivery. Chomping my way through ready for next batch! better than a 3rd espresso. Only recently started drinking this product. Reassured that it is organically sourced too. Good quality product. Very good taste simply mixed with warm water. Very fast delivery. 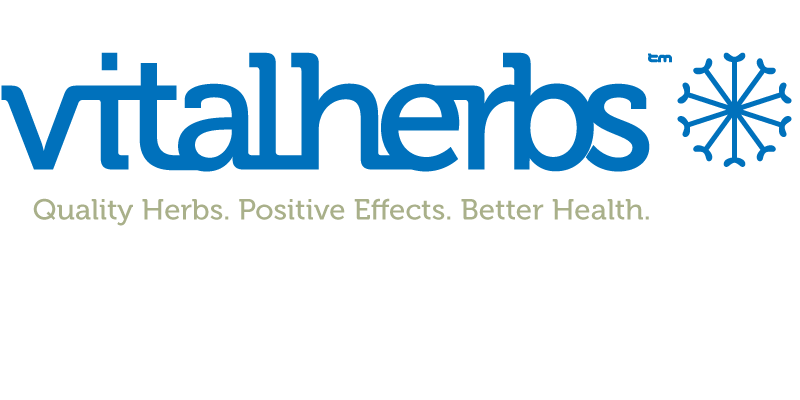 Thank you Vitalherbs, you are at the top. Excellent customer service! 🙂 Fast delivery & great quality! I feel like it has really helped me clear my brain fog and improve my memory! I had to study for an important exam, usually I struggle getting so much information in my brain and retrieve it at a later point. It’s definitely a powerful mushroom with many health benefits, I even like the taste! I take 1/2 to one full teaspoon every day in a hot beverage. I can only recommend! 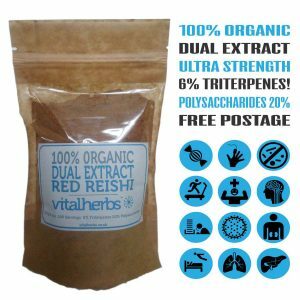 Thanks for the review Chantal Vitalherbs will definitley be taking full credit for your exam results! Have been using Lion’s Mane by Asphalia, your organic Lion’s Mane is much more effective. Excellent service and quality product. Thank you. By far the best lions mane I’ve tried. This is well worth the price. If you are considering trying lions mane this is the one to try. Hi Clay we are really happy to hear that 🙂 Thanks for leaving a review we appreaciate it! Great product, speedy delivery. Perfect! I have only been using this product for a week and have started to see changes so I am hopeful that with prolonged use I will be back to optimal health soon! Speedy delivery! Although I love the zero waste packet it comes in, the jiffy bag could do with being recyclable too. Thanks! This has a mild mushroomy taste, not unpleasant but not exciting either. I haven’t experienced any noticeable mental effect. It might be good to rotate through the different mushroom extracts for health maintenance and resilience building. Was keep informed until package arrived, packaged well, good to see can recycle packaging. Have been using product for several weeks now and feel a lot more energized. I was delighted to find this first class product and can’t recommend it highly enough. Thanks also to Neal for the a wonderful service. Great product but needs better instructions on how to use on the packet. I’ve tried a few different Lion’s Mane extracts and this one is without a doubt the most effective. Thanks we are glad you like our Lions Mane!